Who Wants to Be Trained in Sacred Music? What Does the "Science" Say? The State of Catholic Music in the U.S.
What is unique to Catholic music? 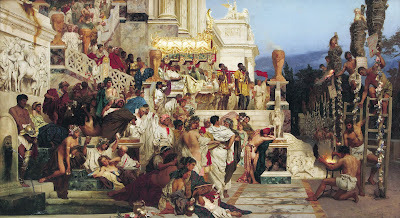 At this time of the year, I find that my mind particularly turns toward the martyrs and Rome. This is for two reasons. For one, we find ourselves today celebrating the feast of Ss. Peter and Paul, both of whom were martyred within Rome. As well, tomorrow in the modern Roman calendar, we mark the feast of the First Martyrs of the Holy Roman Church. In the spirit of these liturgical days, I thought it might be worthwhile to share some brief and random reflections on the martyrs from some early historical sources. Let us take the noble examples furnished in our own generation. Through envy and jealousy the greatest and most righteous pillars [of the church] have been persecuted and put to death. Let us set before our eyes the illustrious apostles. Peter, through unrighteous envy, endured not one or two, but numerous labours; and when he had at length suffered martyrdom, departed to the place of glory due to him. Owing to envy, Paul also obtained the reward of patient endurance, after being seven times thrown into captivity, compelled to flee, and stoned. After preaching both in the east and west, he gained the illustrious reputation due to his faith, having taught righteousness to the whole world, and come to the extreme limit of the west, and suffered martyrdom under the prefects. Thus was he removed from the world, and went into the holy place, having proved himself a striking example of patience. To these men who spent their lives in the practice of holiness, there is to be added a great multitude of the elect, who, having through envy endured many indignities and tortures, furnished us with a most excellent example. Through envy, those women, the Danaids and Dircæ, being persecuted, after they had suffered terrible and unspeakable torments, finished the course of their faith with steadfastness, and though weak in body, received a noble reward. The Persecution under Nero in which Paul and Peter were honored at Rome with Martyrdom in Behalf of Religion. 1. When the government of Nero was now firmly established, he began to plunge into unholy pursuits, and armed himself even against the religion of the God of the universe. 2. To describe the greatness of his depravity does not lie within the plan of the present work. As there are many indeed that have recorded his history in most accurate narratives, every one may at his pleasure learn from them the coarseness of the man's extraordinary madness, under the influence of which, after he had accomplished the destruction of so many myriads without any reason, he ran into such blood-guiltiness that he did not spare even his nearest relatives and dearest friends, but destroyed his mother and his brothers and his wife, with very many others of his own family as he would private and public enemies, with various kinds of deaths. 3. But with all these things this particular in the catalogue of his crimes was still wanting, that he was the first of the emperors who showed himself an enemy of the divine religion. 4. The Roman Tertullian is likewise a witness of this. He writes as follows: "Examine your records. There you will find that Nero was the first that persecuted this doctrine, particularly then when after subduing all the east, he exercised his cruelty against all at Rome. We glory in having such a man the leader in our punishment. For whoever knows him can understand that nothing was condemned by Nero unless it was something of great excellence." 5. Thus publicly announcing himself as the first among God's chief enemies, he was led on to the slaughter of the apostles. It is, therefore, recorded that Paul was beheaded in Rome itself, and that Peter likewise was crucified under Nero. This account of Peter and Paul is substantiated by the fact that their names are preserved in the cemeteries of that place even to the present day. 7. "But I can show the trophies of the apostles. For if you will go to the Vatican or to the Ostian way, you will find the trophies of those who laid the foundations of this church." 8. And that they both suffered martyrdom at the same time is stated by Dionysius, bishop of Corinth, in his epistle to the Romans, in the following words: "You have thus by such an admonition bound together the planting of Peter and of Paul at Rome and Corinth. For both of them planted and likewise taught us in our Corinth. And they taught together in like manner in Italy, and suffered martyrdom at the same time." I have quoted these things in order that the truth of the history might be still more confirmed. We could of course continue on with various sources which speak to the persecution and martyrdom of so many Christians in the Roman empire in these times. Instead I will focus on two points. One is that this consideration of the plight of the early Church further emphasizes the importance of the activities of the Emperor Constantine for the Church, who, with the Edict of Milan, legalized Christianity, removing the penalties associated with it. Accordingly, he is revered as a saint within the Eastern Churches, and given the title of "Constantine the Great" also within the Latin Church. In the second instance, these matters bring us to an extension of our recent consideration of the importance of the breviary, which is the further consideration of the Martyrlogium Romanum or Roman Martyrology. The Roman Martyrology, like the breviary, is a liturgical book proper. It strikes me that in our day, we should strive to be more conscientious of the sacrifice made by the early martyrs. What better way than by reading each day the brief and commemorative accounts carried in the Martyrology, to at least bring them, however briefly, to our daily recollection.